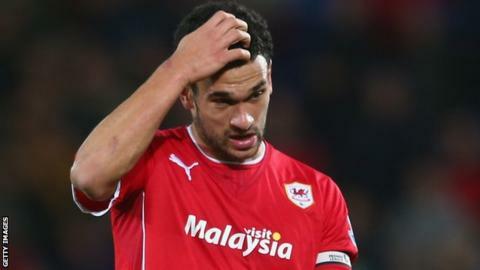 Cardiff captain Steven Caulker says the club have not given up hope of staying in the Premier League. The Bluebirds are 19th with five games left, six points adrift of possible safety following Saturday's 3-0 loss to fellow strugglers Crystal Palace. Manager Ole Gunnar Solskjaer admits his side need a miracle to stay up, but Caulker says it can be done. "We've definitely given ourselves a mountain to climb now but we are still in it mathematically," said Caulker. The Bluebirds paid a then club record £9m to Tottenham to secure the 22-year-old's services in the summer. In the 13 Premier League games since Ole Gunnar Solskjaer became Cardiff boss the Bluebirds have conceded 31 goals. The centre-back has played in all 33 of Cardiff's matches in the Premier League this season. City have failed to keep a clean sheet in their past seven league matches since the 0-0 home draw at home against Aston Villa in February. Caulker described the three goals they conceded in the defeat against Palace on Saturday as "sloppy". He says defence is just one area in where the team needs to improve. "We've got to fix up. We've got to be better defensively," said Caulker. "We've leaked a lot of goals of late and we've got to put them in the other end as well. "It's still possible so we definitely won't write ourselves off. We are going to have to dig really deep. It's going to be five cup finals between now and the end of the season." Next up for Solskjaer's men is a trip to eighth-placed Southampton. The Saints beat Cardiff 3-0 in the Welsh capital on Boxing Day in Malky Mackay's last match in charge. Caulker says it will be a difficult game but the Bluebirds can draw on the experience of getting results against Manchester United and City earlier in the season. "We've got the confidence from how we played at the start of the season," said Caulker, "so we've just got to find that and get back into some form. "Every game's going to be a fight now so we are going to have to show a lot more fight and passion than we did against Palace. "And we need to train hard this week ahead of a tough game away at Southampton."